Fire is very useful; however, when it gets out of control, our only hope for survival and saving our belongings is in having necessary knowledge and skills to control it. Proper knowledge of controlling fire can save lives and prevent expansion of fire in emergencies. To control fire, you must know what materials are flammable, what materials are fire retardant and what materials are fire extinguisher. Many flammable, fire retardant and fire extinguisher substances may be found around your home. 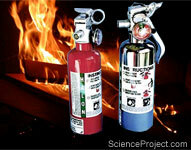 In this project you will study fire extinguishers and fire extinguisher material that may be found at home. Compare different household liquids or solids for their ability to extinguish fire. More details or support on this project is available for the members of ScienceProject.com. Material needed for experiment may be found at home or purchased locally in most areas.